In the 1950’s Casper the Friendly Ghost was a household name and Harveytoons was the Pixar of the times. On June 26th, these two new DVDs (Best of Casper Volume 1 and Best of Casper Volume 2) each offer 10 short Casper cartoons, each around 7 minutes long for a total of 72 minutes per DVD.Â Although the short running times do beg the question of why all 20 episodes couldn’t have been put onto one DVD simply titled The Best of Casper, it’s still a treat to have the “friendliest ghost you know” back for audience’s viewing pleasure, and readily available for a whole new generation of children. The cartoons have been remastered for the digital age, but they still look a bit grainy by 2007 standards. That’s either part of the draw or part of the drawback depending on how you feel about old cartoons. What these 20 episodes will do is remind viewers of simpler times, when a friendly ghost roamed the streets, constantly pouting “Gee, I wish I had a friend to play with.” and that was enough. In an age of CGI penguins and ogres with celebrity voices, it’s a bit of a treat to bear witness to such basic heartfelt hand-drawn cartoons. At the same time, it can also start to feel a bit repetitive the 15th time someone (or something) comes upon Casper and shrieks “A G-G-G-GHOST!” and then runs screaming off stage left. Although the character of CasperÂ is endearing, he’s also a bit dated. That really shouldn’t play into the equation here, though. 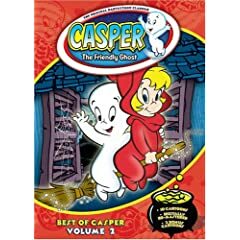 Casper is Casper and viewers everywhere have been waiting to have access to the ghostly charmer on DVD for years now. In the way that sometimes absence makes the heart grow fonder, though,Â maybe watching Casper again after all these years will leave viewers wondering “Was that really all there was to it back then too?”Â But maybe these episodes, and other such cartoons, serve to simply let us know that there was a time when that was all there was to it… and we loved it. Yes there was a time when a child ghost and his friendly antics could entertain us.Â There was a time whenÂ whole episodes could be built aroundÂ two mischevious kittens, a sneezing elephant, a sad hyena, a baby seal, a hungry ostrich, or a slow race dogÂ and that episodeÂ bring us joy and laughterÂ for at least seven minutes at a time. There was a time when “I don’t want to be scary, I just want to be friendly” was a statement that a self-respecting ghost could utter on a theatre screen, and the meanest he would getÂ would be faking a rage after taking a handful of “Mean Pills”.Â Now in 2007, in an age of home theatres, that time can come again in your living room. There’s nothing too special about these cartoons, honestly,Â but the sense of nostalgia they can manage toÂ bring is special, and that’s what justifies the existence of these DVD sets. In between watching the fast-paced, computer-generated cartoons of today, why not pop in a classic and relax? You might be surprised to find out how glad you are that you did. 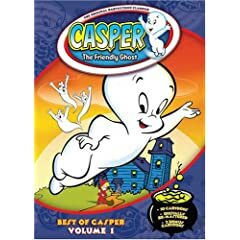 No user commented in " DVD Review: Casper The Friendly Ghost; Best of Casper Volume 1 and 2 "